We packed up the car and headed out for Williams. We stopped off on Route 66 at Seligman for lunch at Westside Lilo’s Café, which was right across the street from Roadkill Café. As we turned into town, there were 3 wooden teepee’s, an old fire truck and other sights that were very reminiscent of the town from the Car’s movie. Lilo’s had pictures of old cowboys, plus stuffed boar, deer, bison, and other animals. 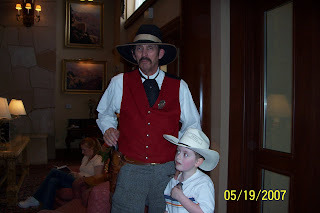 We arrived at the Grand Canyon Railway hotel in Williams which was in the midst of a kid-o-rama with Day out with Thomas. We checked in and met the Marshall. After meeting a "real live" Marshall, Deputy James was ready to go. The first thing James wanted to do was go in the bouncy houses, so off came the shoes and in he climbed. He got knocked over and banged a few times by the kamikaze kids flying through the air, but seemed to love every minute of if. 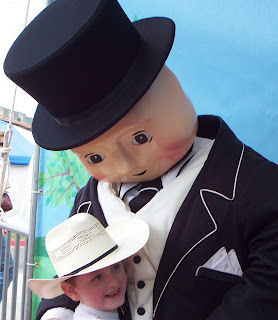 Then, he just had to meet “Sir Topham Hat. 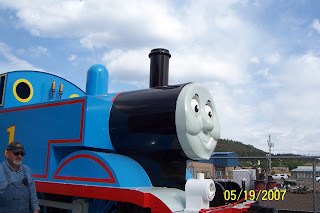 It was time to go for a ride on Thomas. We all (including my parents) hopped on Thomas and went for a 30 minute ride. 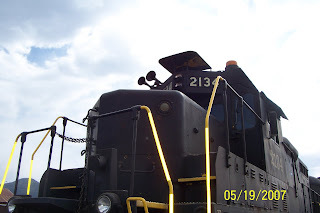 This is the GP7 that help Thomas pull the train. At the end of the ride, James informed me “I am no longer a train fan, I am a Godzilla fan.” So, I guess that is the end of Day out with Thomas. My little boy is growing up and moving on. 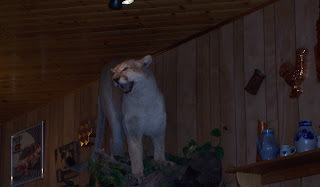 We had dinner at Max and Thelma’s, then went to bed early. For some reason, we were all extremely tired!